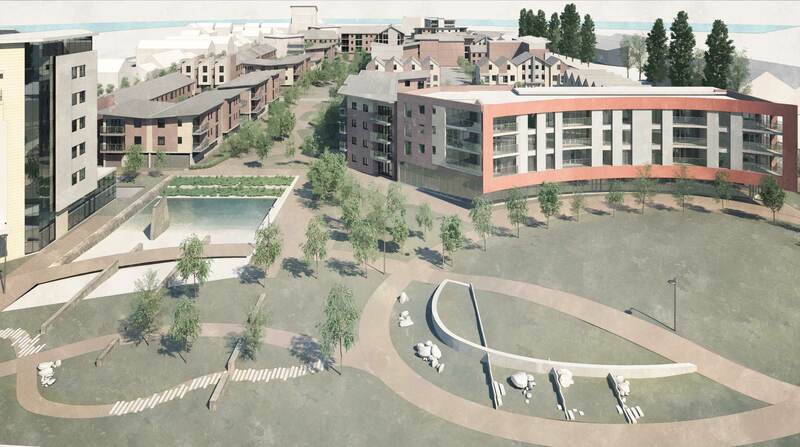 Newport Unlimited (urban regeneration company) ran a design led competition in 2012 to choose the developer for this key strategic housing site in South Wales. The site had previously been purchased by the Welsh Assembly Government and was being offered for sale subject to strict control over density, layout and design. We were approached by our client Sennybridge, who had entered into a joint venture bid with the Seren Group (the largest social landlord in Wales). Our initial design concept helped ensure that our team was selected for the final bid stage of the project. Our evolved conceptual design for the site which showed 300 residential units and mixed-use space for retail/offices was presented to the board of Newport Unlimited in our final interview. Since winning the competition we have worked closely with the client on, and submitted, a hybrid application including 45no. houses and apartments, which are now on site.